I'm so not ready. I've really enjoyed this little break. We'll see if I go back in fall. I'm sort of want to, but on the other hand, I really don't want to. However, I feel like the Lord is leading me (okay, more like kicking me) in that direction and I want to do what He wants me to do in all things, even if it is hard. In other news, David had an interview with a great company yesterday. It's cracking me up, because it's Die Cuts With A View, a scrapbooking company. It would be similar work to what he was doing for Nortel, but with more pay. I'm hoping that this is going to happen. We've got the graphic design business all set up and actually may have our first client--we'll see though. We put an ad in the online yellow pages and everything. I really hope that this is a way for us to pay off some debt and not be so tight all the time. We went camping this past Thursday, Friday and Saturday for the first time since Xander was a baby. We headed up to our family campground in Blacksmith Fork canyon in Cache Valley. The boys had so much fun they almost couldn't stand it. They loved everything: fishing with Grandpa, playing on the lawn, swinging on the swings, watching the fire, roasting hot dogs, finding bugs, watching the hummingbirds, getting dirty, sleeping in a tent, just about everything. I had a nice time too. We had to watch them so closely though, by the end of the weekend, I was beat. I'm not sure I'm quite over it yet. 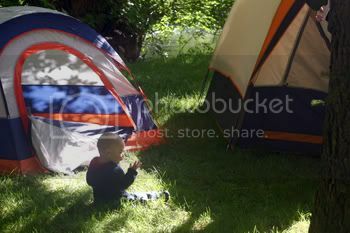 BUT, I think I've gotten over my fear of taking them camping, so we'll probably go a lot this summer. 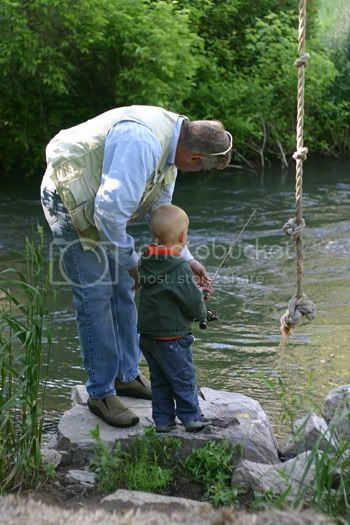 Grandpa helping Maxton get his pole ready. 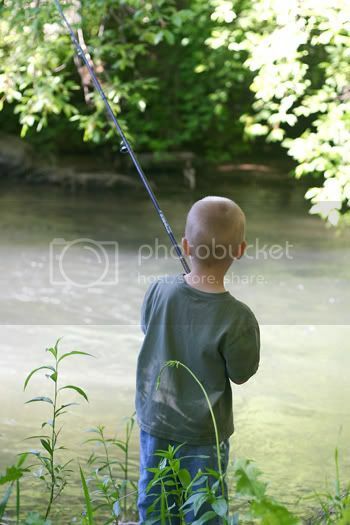 The boys didn't call it "fishing," they called it "fishing pole." Hehe. Xander fishing. He didn't want to stop. Griffin hanging out by the tents. No one slept in the little tent. It was too small for two boys, so in they went with us. Xander climbing a tree. 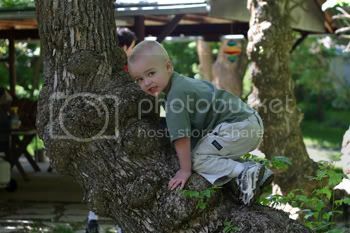 He really can't be old enough to be climbing trees, can he?? 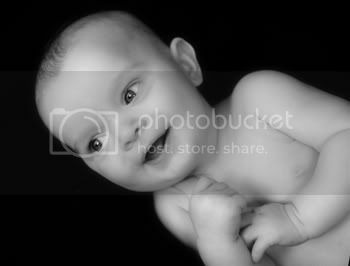 My mom's cousin, Andrea, had me take photos of her little sweetie last week. They turned out just so cute! 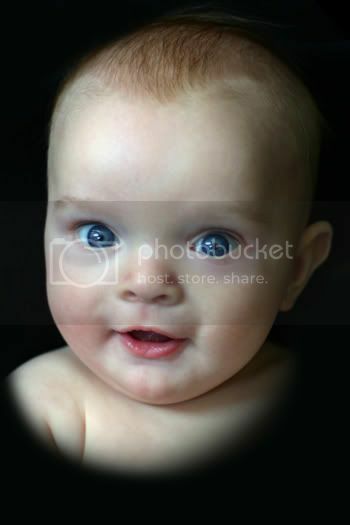 He's four months, which is a difficult age to photograph. I love being able to do this for family, although she did pay me, which was nice. I think I'm getting lots better with every photo shoot. Anyway, here are some of my faves. Kara, your photography looks so good - super professional. I love those b&w ones. And I can't believe Xander is climbing trees! !